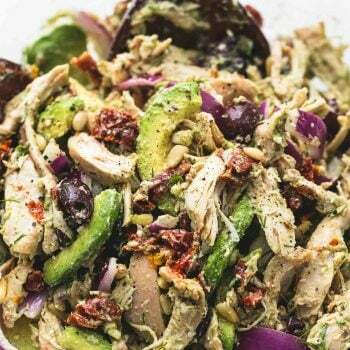 This easy and healthy Greek avocado chicken salad is chock-full of hearty and flavorful ingredients like sun dried tomatoes, olives, onions, avocado, feta cheese, and a creamy herb dressing to die for. In a jar or bowl, combine all dressing ingredients. Whisk until well blended and set aside. In a large bowl combine all salad ingredients. Pour dressing over the top, then toss well to combine. Serve immediately or cover tightly and store chilled up to 3 days.